ELKHART LAKE, WI. 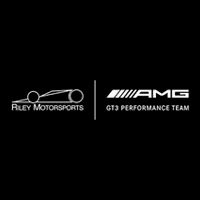 Ben Keating and Mercedes-AMG Team Riley Motorsports rebounded from a Friday practice accident to qualify fifth for today’s IMSA WeatherTech SportsCar Championship race at Road America where later on Saturday the No. 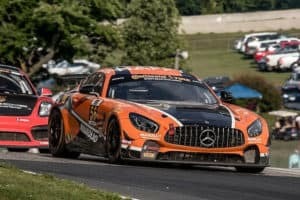 46 TeamTGM Mercedes-AMG GT4 of Owen Trinkler and Hugh Plumb finished third in the IMSA Continental Tire SportsCar Challenge race and took the Grand Sports (GS) class points lead. Keating was uninjured in the heavy contact incident in Turn 8 on the four-mile Road America circuit in Friday morning practice. The Mercedes-AMG Team Riley crew immediately went to work on the No. 33 Mercedes-AMG GT3, which sustained heavy right-front damage, and completed repairs at 4 a.m. CDT early Saturday morning. The repaired No. 33 was third fastest in Saturday’s final practice and Keating then battled in the top five throughout the 15-minute GT Daytona (GTD) qualifying session later that morning. The fifth-place qualifying run is the second best for Keating and the No. 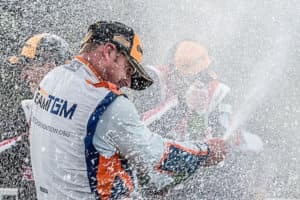 33 team this season, trailing only the fourth-place effort last month at Canadian Tire Motorsport Park where Keating and co-driver Jeroen Bleekemolen went on to win the race. Saturday’s IMSA WeatherTech Championship practice and qualifying schedule was followed by the IMSA Continental Tire series race that once again saw the No. 46 TeamTGM Mercedes-AMG GT4 step up to post the best result of the seven Mercedes-AMG Customer Racing entries competing in the two-hour race. Starting driver Trinkler dodged some major bump-and-run contact incidents that sidelined more than one competitor to handoff the No. 46 to Plumb at mid-race. Plumb in turn survived some close calls of his own and moved into third place in the closing minutes of the race when more attrition sidelined some of the race-leading competition. Trinkler, Plumb and the No. 46 team after winning two weeks ago at Lime Rock Park. 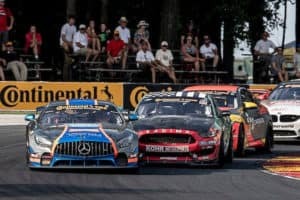 That victory – the first for the Mercedes-AMG GT4 in North America – and today’s podium showing have moved the No. 46 team and drivers to first in the IMSA Continental Tire top-tier Grand Sport class championship standings. With three races remaining on the 2018 IMSA Continental Tire series schedule, Trinkler, Plumb and the No. 46 team unofficially have 191 points, one ahead of the nearest competitor. The No. 46 was joined in the top-10 in Saturday’s IMSA Continental Tire race by the No. 56 Murillo Racing Mercedes-AMG GT4 of Jeff Mosing and Eric Foss that finished on the lead lap in eighth place. Round 7 of 11 GTD races on the 2018 IMSA WeatherTech Championship calendar, Sunday’s featured Continental Tire Road Race Showcase featured event starts at 1:35 p.m. CDT. The two-hour and 40-minute race was preceded by a 20-minute final warmup session earlier on Sunday at 8:30 a.m. CDT. Live coverage of the IMSA WeatherTech Championship Continental Tire Road Race Showcase begins on FOX Sports 1 (FS1) today, Sunday, August 5, at 2:30 p.m. EDT/1:30 p.m. CDT.